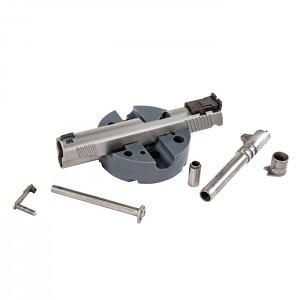 Ideal for firearm assembly and disassembly, the Wheeler Universal Bench Block features a variety of notches, grooves, and holes to assist you in installation of various parts and accessories. Made of non-marring urethane. Perfect for use on 1911 pistols as well as other firearms such as 10/22s. Features a main spring removal recess and boss, barrel link removal channel, rear sight drift channel, and front sight staking channel.